Getting a dead battery in the middle of a drive is never fun! And even worse is waiting hours to flag down someone nice enough to pull over and jump-start your car for you. So ditch those moments all together with a jump starter. After all, these cool devices allow you to get your battery going without the help of anyone else. However, which is the best car jump starter for you? To make the car jump starter buying process easier, I have compiled a comparison chart which helps outline the different brands and types that work well with your vehicles. 4 Buy Your Jump Starter Now! 5.2 So, how many amps does your car need? 5.5 How Do You Use a Jump Starter Safely? 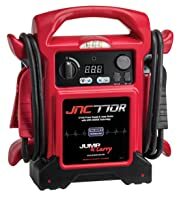 5.6 Do You Need Any Extra/Cool Features of a Jump Starter? Weight 2.4 lbs. 2.5 lbs. 23 lbs. Going on reading our review to choose the best one for you! 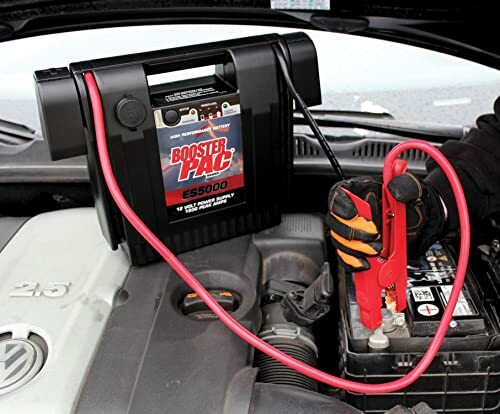 This jump starter is ideal for starting the batteries on your 6L gas and 3L diesel engines. Kicking things off is a jump starter that offers all you’d ever need to get your battery going. With plenty of amps and a great battery, it’ll work for most mid-sized cars out there (and then some). NOCO GB40 is suitable for Cars, Trucks, Boats, Motorcycles, ATV. Looking above, you’ll see that this compact jump starter offers quite a bit of power. At 1000 amps, NOCO recommends that it’s good for 6L gas engines and 3L diesel engines. But we wanted to go all out with testing. So we tried this jump starter with a 6.2-liter Silverado. And to our surprise, it worked! So it’s definitely packing all the power you’d need for your car! 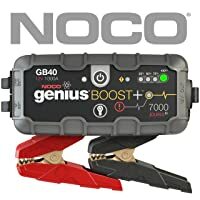 The NOCO GB40 UltraSafeLithium jump starter also works great in cold weather. During a 3-degree Colorado evening, we managed to get a 4.4L V8 BMW M5’s battery up and running with no problems at all! Thus, you can keep it in your car year-round without worry. Lastly, this jump starter recharges epically fast. To be exact, we found the GB40 went from dead to 100% battery in about 4-5 hours. NOCO GB40 is certainly one of the fastest charging jump starters out there! 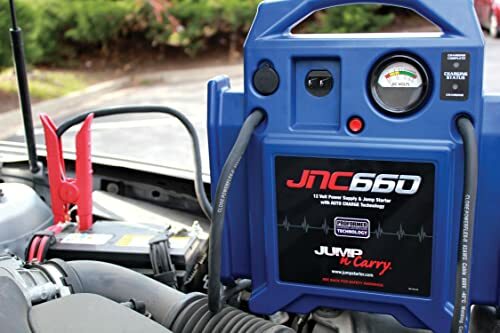 This jump starter is ideal for starting the batteries on your 6L gas and 3L diesel engines. That accounts for most sedans and smaller trucks. The DBPOWER DJS50 is used for starting your battery in your 6.5L gas and 5.2L diesel cars. DBPOWER is here with a jump starter that offers one of the best LCD screens out there. And if that’s not enough, it’s portable enough to fit in your car’s seat pockets. DBPOWER DJS50 works for Cars, Motorcycles, Yacht, Snowmobiles, etc. First of all, the DBPOWER DJS50 provides one of the clearest LCD screens on the market. It’ll display the exact amount of remaining power. Moreover, you’ll also see your output voltage. So it does a great job of displaying how much use you’ll get between charges. Another great feature here is the battery efficiency. We were able to jumpstart a 2010 Mitsubishi Lancer Evolution twice. And before recharging, we jumpstarted a motorcycle as well. And the end result? More than 60% charge remaining! Now that’s an impressive battery! Also separating this jump starter from its competition is that it allows you to manually switch between voltages. Specifically, you can choose from 12V, 16V, and 19V. Either way, you’ll be able to choose the most optimal option for charging your devices. 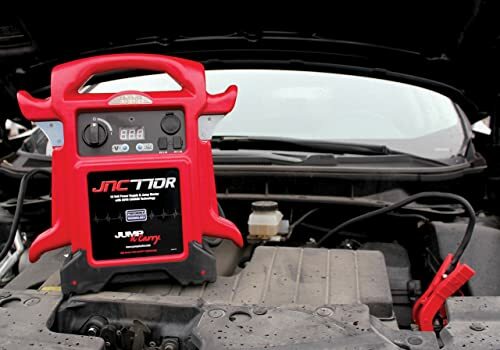 The jump starter is great for starting gas motors up to 6.2L and diesel engines up to 5.0L. If you’re new to jump-starting batteries, the TACKLIFE T6 offers all you’ll need to get started. With some modern safety essentials and excellent ease of use, it’s not hard to justify using it for your car! 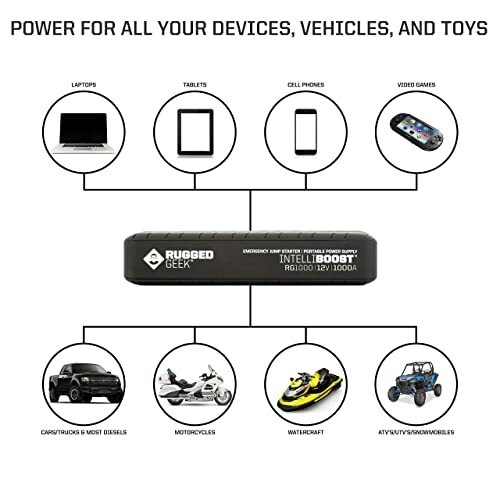 Portable Power Pack for Cars, Truck, SUV, UL Certified. One of the most unique aspects of this jump starter begins with its safety features. Specifically, this starter will detect battery voltage before sending a current. So if you’re doing anything wrong, this jump starter will start flashing and beeping. It’s definitely a great way to avoid dangerous mistakes. 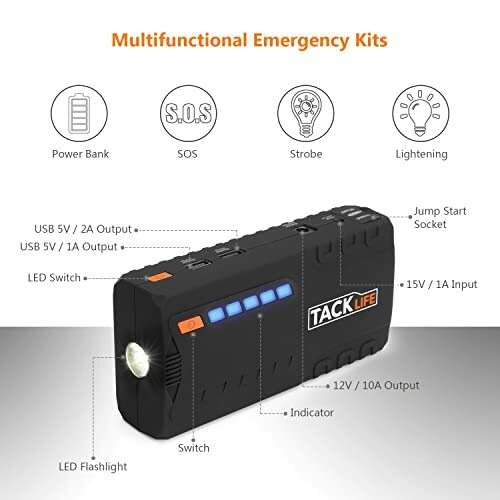 Moreover, the TACKLIFE T6 is one of the easiest jump starters to use. There’s no crazy screens or features here. Even reading your battery life is as easy as reading the lights on the outside. Seriously, it doesn’t get much easier than this. So overall, this battery is a great quick fix for all your car’s needs. Alongside getting your battery jump started, the air compressor is also in place. And with 35 psi, it definitely works for keeping your tires topped off. During our tests, we were able to add a touch of air pressure in only a couple of minutes. Thus, it’s actually a pretty nice addition. The TACKLIFE T6 is great for starting gas motors up to 6.2L and diesel engines up to 5.0L. 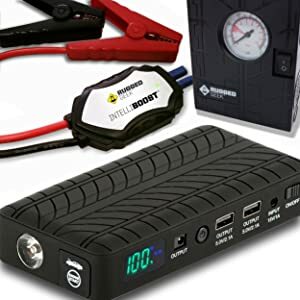 This jump starter is perfect for starting just about any passenger vehicle out there. It’s also ideal for lighter commercial cars. Are you looking for a jump starter that packs endless amounts of power? Then you can’t go wrong with the JNC 660! This starter is one of the best when it comes to supplying high amounts of amps. Looking at this JNC 660’s amps alone, you’ll see this battery packs some serious power. Honestly, during our tests, this starter was enough to get the juices flowing through the battery on a Low Cab Forward! In other words, it’s perfect for commercial vehicles. Also nice is that the carrying handle makes toting this jump starter around quite easy. So if you ever need to jump start multiple cars at once, the carrying handle makes that a breeze. Lastly, the JNC660 even packs a built-in charger! We can’t even count the times we lost and needed to replace the chargers for our jump starters. So having one attached and built-in makes life all the easier here! The JNC770R gets batteries started in most passenger cars and light commercial vehicles. Here’s another large jump starter that packs a copious amount of amps. And as an added bonus, you’ll even get a few fun extras thrown in, such as a USB port. If you’ve ever wanted long-reaching cables, you’ll get that with the JNC770R. These extend to roughly 68-inches. So reach won’t be an issue by any means. It certainly was never a problem for us while testing. Plus, it also allows more convenient options for placing this starter when working on a battery. Another nice feature here is the inclusion of 2 USB ports and an LED light. Typically, these larger starters skimp on useful extras such as these. So it’s nice to have them if you ever find yourself in a pinch in the later hours of the night. Lastly, this starter offers some impressive battery life for all its power. We found it could jump-start more than 20 cars before needing a recharge. So it’s fantastic if you work in an industry like providing roadside assistance. This starter is great for 4L gas engines and anything smaller. 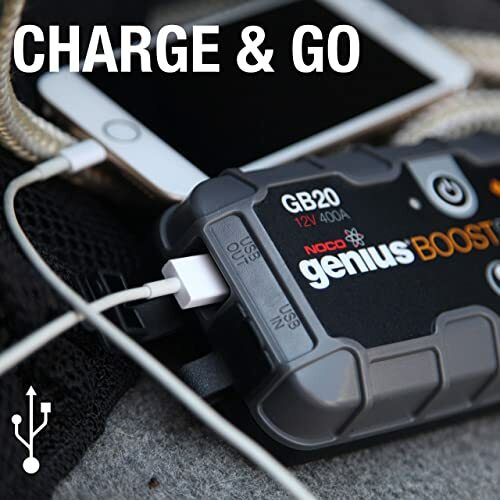 So it’s great for getting the battery started in your car, motorcycle, lawn mower, etc. Ever wanted a charger that’s ideal for small engines? Then you can’t beat the portability of the NOCO GB20. 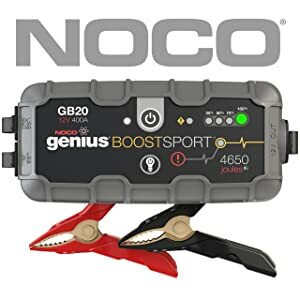 NOCO GB20 is suitable for Cars, Trucks, Boats, Motorcycles, ATV. One of the most notable features of this starter is the USB in port. So if you ever lose your charger, no worries. An Android-style smartphone charger will get the job done just fine. Also, the NOCO GB20 is portable enough to fit in most pockets and handbags. So we found it especially useful for those quick weekend trips to the mountains. Without it taking up too much space, you can bust this starter out and get the batteries going on those ATVs and dirt bikes that sat dormant for a few weeks! Lastly, we found this starter is downright durable given its size. We dropped it quite a few times and encountered no noticeable damage. What’s more, is that we even dropped it in a pretty deep puddle and it still worked fine thereafter. So it’s definitely safe for use in the rain and snow! 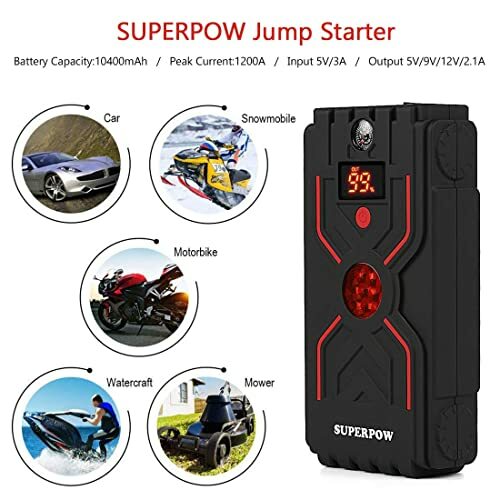 The SuperPow G30 jump starter is ideal for providing power to batteries in cars with motors up to 6.5L gas and 5.0L diesel. Want a jump starter with every safety feature under the sun? That’s exactly what you’ll get with this SuperPow G30. And as an added bonus, it even comes with 3.0 USB support. Suitable for Cars, Snowmobiles, Motorbikes, Watercraft, Mowers. Kicking things off, this is possibly the safest jump starter ever! Seriously, if you can imagine a safety feature existing, it’s right here in these clamps. Some examples include anti-reverse protection, temperature protection, voltage regulation, etc. So if you’ve never jumpstarted a battery before, what better place to start than here? Another standout feature is the power. This is one of the most portable starters out there. Yet you’re still getting some impressive amps coming out of it. We even tried jump-starting a Nissan Titan in less than 0-degree weather. And to our surprise, it started up in less than 5 minutes! So it’s great for cold weather as well! Lastly, you’ll get a 3.0 USB port here. So you can charge devices like your phone really fast here. In our experience, it definitely felt quite a bit faster charging a smartphone from 0-100% compared to a traditional USB port. 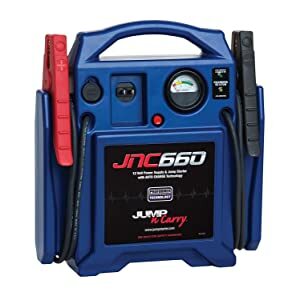 This jump starter is great for getting the battery powered in most passenger and light commercial vehicles. Here’s another fantastic starter that’s packing some impressive specs in terms of durability and power! Plus, it’s a pretty compact shape for all that power inside. First of all, this is a jump starter that’s commonly used by roadside assist companies. So that alone should tell you that it offers quite the power and reliability. But even when you pick up this batter, it feels downright solid! And with 400CA, it’s sure to get just about any car up and running. We tested it with a diesel Silverado and got the battery charged in no time! Also, despite this jump starter’s size, it’s super easy to carry. It’s narrow and easy enough to grip. So moving it around is never an issue. Plus, the handle is placed just right that it feels comfortable to lift and hold! Moving off that last point, the ES5000 is deceptively compact. We found it fit into the back of any work truck with ease! So it’s definitely ideal as a jump starter for any commercial vehicle! All in all, this jump starter is used for powering the battery in most passenger vehicles. 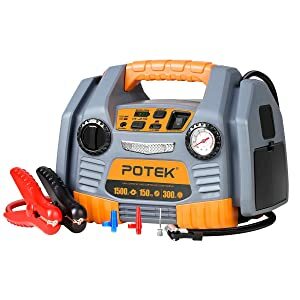 Potek offers one of the most unique jump starters on the market. Not only will you get some high amps here, but you’ll also get two AC outlets as well. So you can also think of this like a mini-backup power source. First of all, this jump starter comes with one of the best tire inflators you’ll find. We tested it and found the 150 psi inflated tires in about 8 minutes. So it’ll definitely be reliable in a pinch. Plus, you’ll even get a few nozzles for filling up basketballs and such. Another great feature here is the 300-watt power inverter and AC ports. As mentioned earlier, you can really view this as a mini-backup power source. We tested it with some low power speakers and found it kept them powered for a few hours. So it’s definitely reliable. At the end of the day, this jump starter really feels more like a do-it-all type of tool. The two plug-ins have their uses at the most random of times. The USB port is great for topping off your phone’s battery. And lastly, you have enough amps here to jumpstart an Escalade without problems (worked for us in about 30 seconds to be exact). So really, it’s perfect for any roadside issues you’ll experience. All in all, the POTEK Portable Power Source jump starter is used for powering the battery in most passenger vehicles. 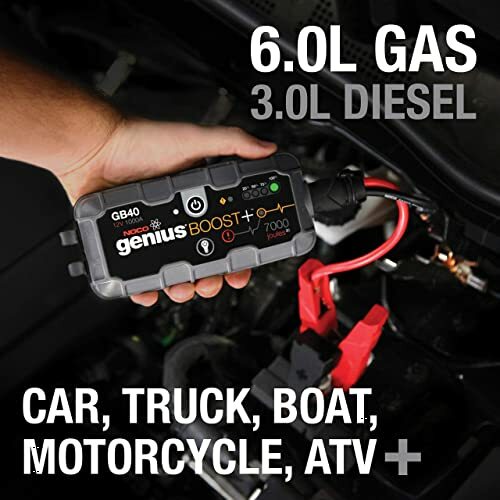 This jump starter is perfect for getting the battery running in gas engines up to 7.0L and diesel engines up to 3.5L. The Rugged Geek RG 1000 packs one of the most unique jump starter designs on the market. What’s more is that it also packs its acclaimed Intelliboost safety feature, which works exceptionally well! Upon looking at this jump starter, you’ll notice that it packs a cool tire tread design. On the one hand, this is certainly a one-of-a-kind look. But on the other hand, it also provides an ultra-comfortable grip. So you won’t need to worry about dropping it often. The Rugged Geek RG1000 also comes with an extremely low discharge rate. We let it sit dormant for 6 months and found it still had some charge left in it. Most jump starters are lucky to have life left after a week of no use! And lastly, there’s the Intelliboost feature. And no, this isn’t some silly marketing name. Instead, It’s a safety feature that won’t send power through the cables until they’re aligned with the correct terminals. In other words, this safety feature ensures you’re using the starter right. It’s no surprise that all 10 of these jump starters do their jobs quite well. But, let’s be honest. We all know that some do their jobs better than others. And in this case, three happen to reign on top for a variety of reasons. So if you’re looking for the best, you can’t go wrong with the following choices! It’s hard to beat a jump starter that simply does its job so well! For starters, the price is definitely right for all 1000 amps it supplies. Plus, how many other portable starters are capable of starting a truck in the cold Colorado snow? The short answer: not many! You can’t beat the basics! This TACKLIFE starter offers one of the best safety features out there by detecting voltages before sending currents. Plus the warning when you’re not set up right prevents potentially dangerous mistakes. But most of all, this starter is simply easy to use! It’s so easy that you probably won’t even need a manual—now that’s a sign of quality design! A JNC simply needed to make the list. After all, it’s hard to find this much power in a single jump starter! And what sets this one apart from the other super-amped starters is the fact that it packs some extra features. That LED light simply performs wonders in the dark! Special mention also goes to the 68-inch cable! Seriously, this makes life extremely easy when jump starting a car—you won’t even need to move your JNC from its place with a cable this long. 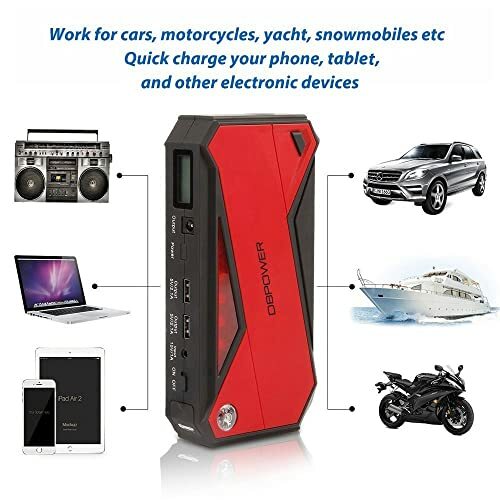 Buy Your Jump Starter Now! Don’t wait to get stranded on the side of the road in the middle of the night! You never know when your battery will suddenly give out. So make sure you’re prepared with a jump starter kit in your car. After all, the five-minute wait to get your battery running again beats the unknown amount of hours you’ll spend waiting for another car or roadside service to come to your aid. So before any of that happens, buy your jump starter today. And if you need, read our reviews a few more times to make the right choice for you! On paper, a jump starter’s job is pretty simple—power up your car’s battery. So surely, there’s not much difference between the market’s jump starters, right? WRONG! In truth, you’ll find quite a few specs that’ll separate a crappy jump starter from a stellar one that’ll last you years to come. Therefore, to ensure you get a quality starter for your car, be sure to check these features. First things first. You’ll want a jump starter with the right amount of power to get your car going. 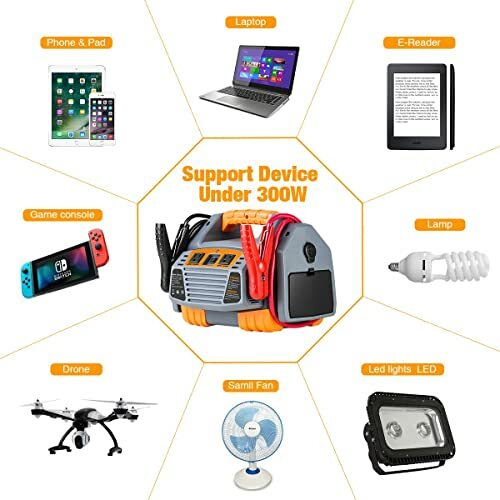 But how do you know how much power a jump starter will deliver to your battery? Well, it’s not a simple answer, but amps are a great place to start. Overall, you’ll encounter two different types of amp measurements. So be sure to check these carefully when buying a jump starter. This refers to the highest amount of power your jump starter will produce for a quick split second. As you’d guess, these numbers tend to be pretty high and flashy. Unfortunately, it’s pretty rare that little surge of power is enough to get your battery going immediately. So this measurement tends to be less reliable than your cranking amps. Now, this number is what refers to the power your jump starter will produce over long periods of time. As such, this is a measurement that’ll apply to your car more often. So when possible, prioritize this number over your peak amps. So, how many amps does your car need? It varies—heavily. As a rule of thumb, larger engines will require higher amounts of cranking amps. Moreover, diesel engines will also require more amps as well. So, this means a 3L 4-cylinder gas engine will only need about 200 cranking amps. On the other hand, an 8-cylinder diesel needs in the ballpark of 700 amps. As you can see, that’s quite the variance. So when in doubt, check the jump starter’s manual. And if nothing else, opt for more power. In most cases, you’ll want your jump starter as part of your car’s emergency kit, right? Then you’ll want something compact and easy to carry—something that’ll fit in your glove box. For most cars, you can find jump starters about the size of a smartphone. Even better, they usually only weigh 1-2 lbs. However, keep in mind that commercial vehicles will often require larger jump starters. But even with that said, you can still find them for less than 20 lbs. So it’s still relatively easy to carry and store in your car’s trunk area. If you’ve never jump started a car before, then this one is critical. 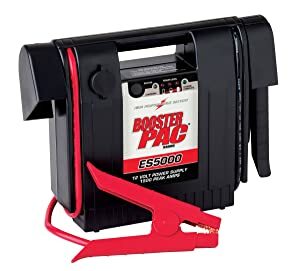 In general, plenty of jump starters will offer some safety features that prevent you from doing anything dangerous while trying to jump-start a battery. Some examples include short circuit protection, over-current protection, and even refusing to send power if the terminals aren’t correctly aligned. And that’s not even the start of all the cool safety features you can find. But really, nothing beats using a jump starter safely! How Do You Use a Jump Starter Safely? Crank your car for 3-5 seconds. DON’T crank the car any longer if you don’t want any extra car issues. Sound simple? That’s because it is! And with some practice, you’ll have it down in no time at all! 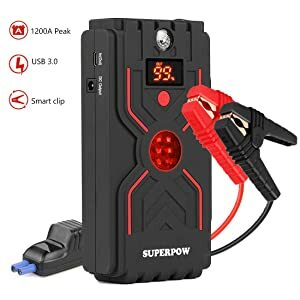 Do You Need Any Extra/Cool Features of a Jump Starter? The answer is completely up to you! 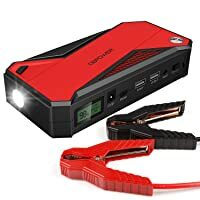 On the one hand, extra features like LED lights, USB ports, and air compressors make your jump starter the Swiss army knife of car tools. Sure, they might not work as great as OEM parts, but at least they’re there. Generally speaking, they’re incredibly useful in a pinch. For example, the LED lights are usually only 100 lumens. It’s not incredible, but when you’re working on a car at 2 am on the side of the road, any light is good light. And then there’s the added air compressor. On average, these tend to only pack around 150 psi. So it’s enough to top off the tires in your sedans and smaller cars. Just don’t expect to inflate any big rig tires. The list of extra features goes on and on. But really, if you want them, there’s no harm in buying a jump starter that has them. 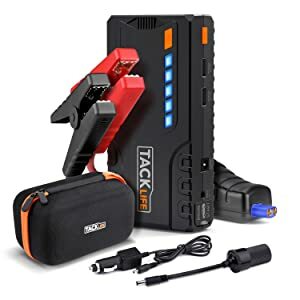 Bonus: 10 Best Portable Jump Starters Review and Buying Guide 2019.